Union County, NJ – The Union County Board of Chosen Freeholders invites visitors of all ages to meet live animals, celebrate wildlife, learn about environmental conservation and try their hand at outdoor skills at the annual Wild Earth Fest, hosted by the Trailside Nature and Science Center at the Watchung Reservation in Mountainside on Sunday, April 28 from 11:00 a.m. to 5:00 p.m., rain or shine. This year’s hands-on activities include the Atlantic City Aquarium, which returns with a spectacular traveling touch tank exhibit featuring starfish, sea urchins, stingrays, horseshoe crabs. The Swift Farms Petting Zoo will also bring a miniature pony, lambs, goats, baby chickens, rabbits and more. Wild Earth Fest also includes three live animal presentations, beginning with Travis Gale of Eyes of the Wild, who will present Mammal Mania. Travis will share the life stories of each animal in an entertaining presentation at noon and 1:00 p.m.
Dominic Rizzo, of Rizzo’s Reptile Discovery will entertain and inform as he presents a host of live reptiles at 2:30 p.m. and 4:00 p.m.
Back by popular demand, Vinnie Reo and his wolves from Wolf Visions will dispel the myth of the “Big Bad Wolf” and explain their role in keeping a balanced ecosystem, at 3:30 p.m. Visitors can also learn about outdoor skills including camping, canoeing, hiking, archery, birding and nature photography. Ongoing activities include Eco-Art for a nominal fee, a rock wall, free face-painting and the Recycling Olympics. Green-themed art and gifts will also be available for purchase as well as food and snacks. Music will be performed by Glen “Wreckin’ Ball” Waldeck. Glen and his Daughter, Holly, bring to the stage a musical journey in an array of topics. Glenn’s songs have been heard on NBC, PBS, CNN and the Discovery Channel. The Union County Board of Chosen Freeholders and the Trailside Museum Association will recognize and honor the environmental heroes in our community during the Environmental Hero Awards at 2:00 p.m. Vendors and exhibitors include the NJ Audubon Society, Rizzo’s Wildlife World, USDA Wildlife Services, Union County Archery, Citizens’ Climate Lobby, Toadshade Wildflower Farm, NJ State Park Service, Friends of the Great Swamp, NJ Mycological Association, NJ Forest Fire Service, Union County Master Gardeners, 4-H Master Tree Stewards, and much more. Admission to Wild Earth Fest is $5.00 per person. Children six years old and younger are free. Admission includes entrance to the “Touch a Truck” event being held concurrently in the Watchung Reservation lower loop parking lot. No pets are permitted at these events. The Wild Earth Fest is supported in part by funding from the Union County Clean Communities Program, in cooperation with the New Jersey Clean Communities Council. 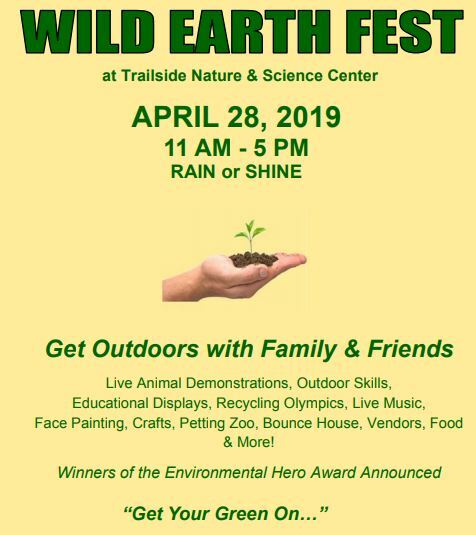 For more information about “Wild Earth Fest” or other upcoming programs or events at Trailside, call 908-789-3670 or visit ucnj.org/trailside. The Trailside Nature and Science Center is located at 452 New Providence Road in Mountainside and is a service of the Union County Board of Chosen Freeholders.